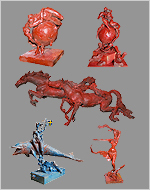 Sculpture is three-dimen-sional artwork created by shaping or combining hard materials, typically stone such as marble, metal, glass, or wood, or plastic materials such as clay, textiles, poly-mers and softer metals. Sculpture is an important form of public art. A collec-tion of sculpture in a garden setting may be referred to as a sculpture garden.